Modern buildings frequently contain rooftop mounted heating/cooling systems and an array of communication antenna. Traditional methods of lightning protection, such as air terminals (Franklin Lightning Rods) and a network of downconductors connecting to an integrated grounding system, are not well suited to protect these modern devices. The Isolated Downconductor, part of the ERITECH® line of Facility Electrical Protection products from ERICO®, offers a solution to this problem by applying a high performance insulation around the downconductor. The same isolation as 1,000 mm of air separation can be provided, enabling the downconductor to be mounted directly on the mast or structure to be protected. The Isolated Downconductor provides a traditional air terminal fitted to an isolated fiberglass-reinforced plastic (FRP) mast. The Isolated Downconductor internally connects to the air terminal inside the FRP. The FRP mast has natural isolation properties, high strength for windy sites and low weight to minimize mast loading. The system features a lower-cost cable targeted at the typical shorter installation requirements of the telecommunication industry. The cable is designed, tested and applied to meet the requirements of IEC 62305 lightning protection standards, and appropriate products are tested in compliance with EN 50164-1 and EN 50164-2. The Isolated Downconductor has also been successfully tested by an independent laboratory using the industry accepted “Zischank” method*. Here a length of cable is tested with voltage impulses in comparison to an air gap. If the parallel air gap breaks down repeatedly before the cable, then the equivalent safety distance of the cable is greater than the air gap distance. W. Zischank “Insulators for isolated or partially isolated lightning protection system to verify safety distances” 23rd International Conference on Lightning Protection (ICLP), Firenze (1996), S 513-518.
clearance distance of 2 m). Section 6.3 or NFPA780 Section 4.21). If the maximum cable limitations above cannot be adhered to, then it is possible to use two parallel downconductors. 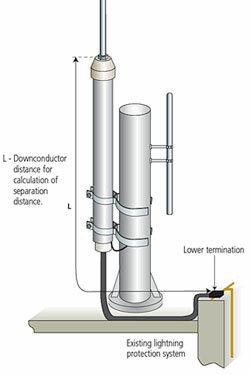 The ISODUAL adapter allows a second Isolated Downconductor to be connected to the air terminal. 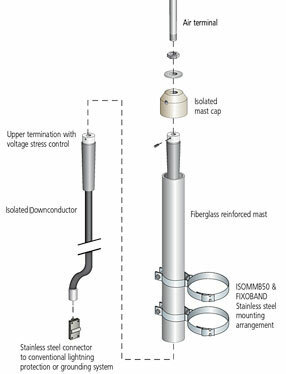 The second ISODC Downconductor is mounted externally to the Isolated Mast and fixed with UV-stable, non-conductive cable ties.